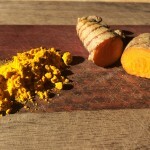 07:56:30Turmeric is a fascinating remedy that is nourishing, healing, and anti-inflammatory. 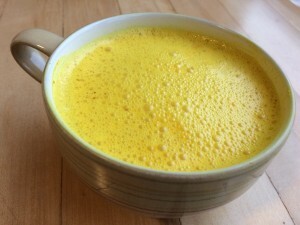 There are no real contraindications for taking turmeric at culinary doses (such as the Golden Tea recipe below and Cooking with Turmeric suggestions) but when you are taking isolated curcumin or potent turmeric supplements (or even when taking Turmeric Bombs or Turmeric Paste), then you will want to consult your healthcare physician, especially if you are on antiplatelet or blood thinning medication, have gallstones, bile duct obstruction, stomach ulcers or hyperchlorydria (high stomach acid). It is also important to note that culinary turmeric will stain nearly everything in its path. So, if you don’t want yellow finger tips or yellow-stained hands, wear non-latex gloves when working with turmeric, use a cutting board you don’t mind having yellow marks, wipe your counter with cold water right away if it turmeric spills on it, and also your grater may turn yellow/orange & look like rust, but its most likely just turmeric. 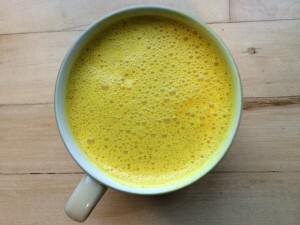 There are many recipes out there for Golden Tea, otherwise known as Golden Milk, Turmeric Tea, Anti-Inflammatory Golden Milk. All of the recipe names point to the fact that turmeric works as a natural anti-inflammatory, and it is gold in color, thanks to the active ingredient curcumin (*not to be confused with cumin*). There are a few ingredients that you can add to the tea to help enhance the flavour, such as ginger, cinnamon, nutmeg, and ground cardamum. 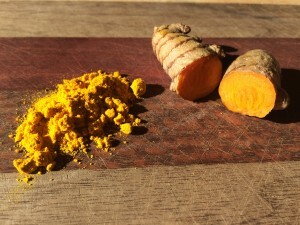 But more importantly, there are ingredients you can add to improve the healing properties turmeric by way of increasing the absorption of curcumin: fat & black pepper. 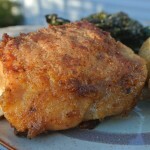 Here is our recipe. Give it a try and tweak it to make it your own! If you want a real decadent treat, replace your choice of milk with coconut cream (the thick part of canned coconut milk). Place all ingredients in a saucepan, heat on high until it's just about to boil, then lower the heat to simmer for about 5 mins. Pour into a high powered blender and blend on high for about 10 seconds. We don't mind a few ginger strands so we just pour into a mug & enjoy, but if you do mind the texture, strain into a mug and enjoy! Butter chicken is a crowd pleaser in our house. In this Butter Chicken recipe, we replace heavy cream with coconut cream, and add in 1 Tbsp turmeric powder. This is an inexpensive DIY supplement which contains fat & black pepper to help increase absorption. Honey can be added to improve the flavour and give it a desirable sweetness. You can chew these little bombs, let it dissolve in your mouth, or swallow it whole with water. 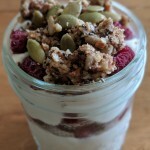 There are recipes out there that also add quercetin, which may also increase absorption but we’ve created a simple recipe that uses ingredients that you likely already have on hand. It is best to start by keeping your coconut oil at room temperature. 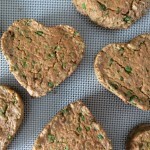 If you store it in the fridge, take it out about an hour before you make these so it can soften a bit. 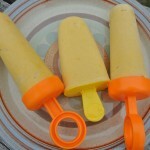 If it is summer and your coconut oil is liquid, then you will end up with turmeric blobs instead of bombs – You will lose the aesthetics of having a bomb, but you won’t loose the medicinal aspect of the bomb. 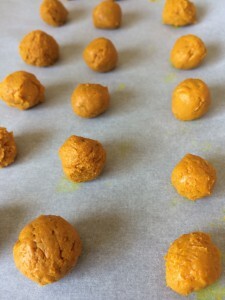 We are in the midst of ‘fancifying’ a recipe for these, but here is the bare bones recipe for Turmeric Bombs. Mix all of the ingredients together well with a spoon. This may take a few minutes, as you work on mixing the coconut oil chunks with the other ingredients. When everything is well mixed together, get a small bowl with water in it to dip your fingers in while you make the small bombs. Line a baking sheet with parchment paper, and clear some room in your freezer for the baking sheet. Spoon out a small marble-sized ball, dip your fingers in the water, and roll the ball into a smooth ball and place it on the prepared baking sheet. Continue to do this until you have no mixture left. It will make 40-50 balls. Place the balls/baking sheet in the freezer for about 1 hour to let them set. Then, remove the bombs from the baking sheet and store them in a glass jar, in the freezer so they maintain a creamy texture. Take 1-2 bombs/day for maintenance, and up to 4 to treat aches and pains. 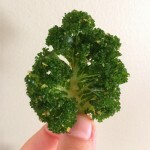 You may be surprised that you may start to actually crave these little golden nuggets! This method of preparing turmeric is very similar to turmeric bombs but you cook the turmeric powder with water to give you a potent turmeric supplement. If you experience gas & bloating when taking the paste, cut back on the dose until you no longer experience digestive upset. Directions: Combine turmeric powder and water in a small saucepan, and bring to a boil. 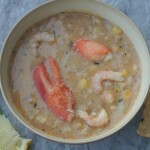 Reduce the heat simmer for 7-10 minutes. Stir often to prevent sticking, and add more water as need to keep it to a paste consistency (this can be adjusted to suit your preference). 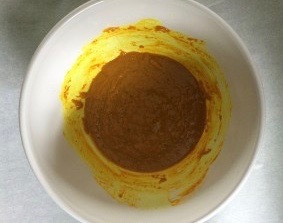 Remove mixture from the heat and allow it to cool until the pot is warm to the touch. Add oil & pepper, and stir thoroughly until they are completely mixed in. 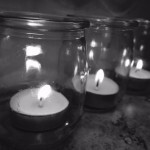 Store in a clean, sterilized jar in the refrigerator for up to 10-14 days. If you see any signs of mold, or notice an ‘off’ flavour, discard immediately. 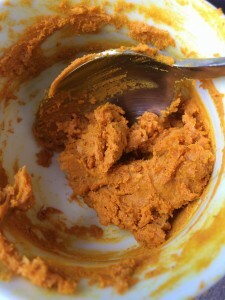 If you know that you won’t use all of the mixture within two weeks, you can freeze some for later use. Take 1/4 tsp 1-2 times daily, with food.